60 n Performance & Hotrod Business n April 2015 HOTROD wise on that truck. The owner wanted a show car that would win 100-percent of the time, any show he went to, and those are the type of projects you only get so many times in a lifetime. It was remark- able, and crazy too. The truck came in with fiberglass fenders and running boards and a square box throwaway, so we basically got to build it from scratch." 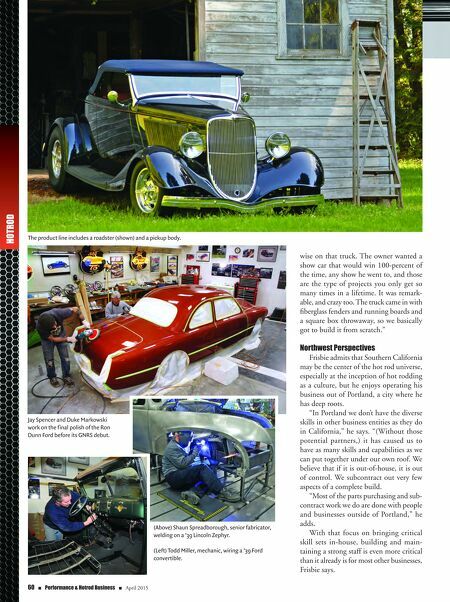 Northwest Perspectives Frisbie admits that Southern California may be the center of the hot rod universe, especially at the inception of hot rodding as a culture, but he enjoys operating his business out of Portland, a city where he has deep roots. "In Portland we don't have the diverse skills in other business entities as they do in California," he says. "(Without those potential partners,) it has caused us to have as many skills and capabilities as we can put together under our own roof. We believe that if it is out-of-house, it is out of control. We subcontract out very few aspects of a complete build. "Most of the parts purchasing and sub- contract work we do are done with people and businesses outside of Portland," he adds. With that focus on bringing critical skill sets in-house, building and main- taining a strong staff is even more critical than it already is for most other businesses, Frisbie says. The product line includes a roadster (shown) and a pickup body. Jay Spencer and Duke Markowski work on the final polish of the Ron Dunn Ford before its GNRS debut. (Above) Shaun Spreadborough, senior fabricator, welding on a '39 Lincoln Zephyr. (Left) Todd Miller, mechanic, wiring a '39 Ford convertible.